is published bi-annually by the Department of English at Binghamton University. As a nonprofit organization, we are grateful to our generous sponsors at Binghamton University for their support, and invite others to help us publish the best established and emerging voices by contributing work and subscribing to our journal. 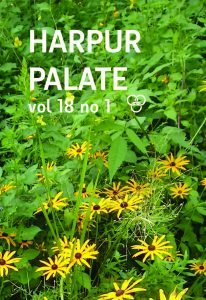 We, the staff at Harpur Palate, are all students of writing who are passionate about this publication. Issue 18.1 is now available!